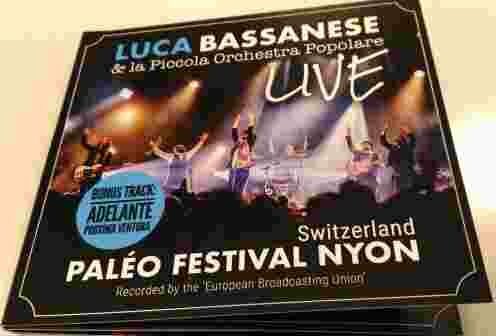 Luca Bassanese is without question one of the main characters of the new committed Italian popular music. Over the years (11 albums, Luca has eraned such nicknames as 'The Italian Kosturica' or 'The Italian Manu Chao'. ​Enlivened by the powerful folklore of the two shores of the Adriatic, he fans the embers of social engagement with transalpine tarantellas, klezmer hints of brass or heady gusts of Opera Buffa. Multi-awarded (MEI 2015, Musicultura, Marcello Torre National Awards), Luca has collaborated with various artists from different backgrounds and countries. Among them, to make a few names: Stefano Florio, the Original Kocani Orkestar, Bachir Charaf, and Italian theater master Dario Fo. Luca's shows put you in a good mood and make you want to dance, move your feet and lose yourself for a moment in a Fellini-inspired fantasy world. Outside Italy, Luca has received standing ovations in France, Belgium, The Netherlands, Switzerland and Hungary, demonstrating that his performances are accessible to people of all ages, creeds and backgrounds, and non only to Italians. 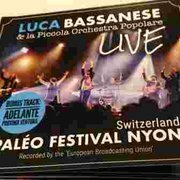 LUCA BASSANESE & la P.O.P. Live At Paléo Festival Nyon – Switzerland (Art. Prod. by Stefano Florio) - was recorded at the prestigious Paléo Festival in Nyon (CH) on July 20, 2018 by the ‘European Broadcasting Union’. It contains Luca Bassanese & P.O.P best songs.